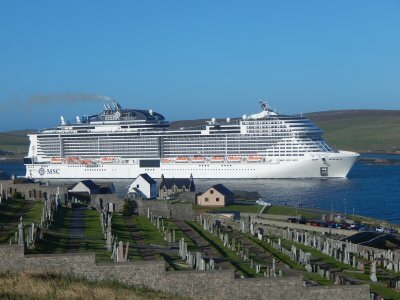 Shetland has become a popular destination for cruise ships, being a convenient port of call for cruises between Norway, the Faroes and Iceland. Last year about 60,000 passengers put in at Lerwick Harbour and the parish extends a warm welcome to all visitors. You will normally find the church unlocked. The presbytery is next door. In June there is an annual yacht race between Bergen and Lerwick. Last year about 40 Norwegian boats took part. We also welcome fishermen on the pelagic boats, some of whom are regular visitors on their way back from the Shetland fishing grounds to Irish home-ports. 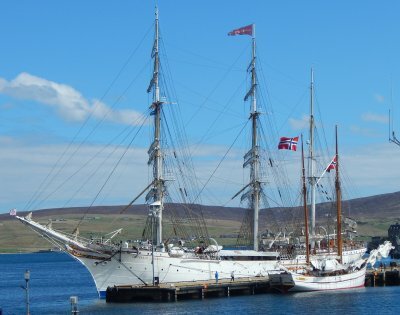 'Statsraad Lehmkuhl' and the 'Loyal' at Victoria Pier, Lerwick. Flying the Norwegian flag. 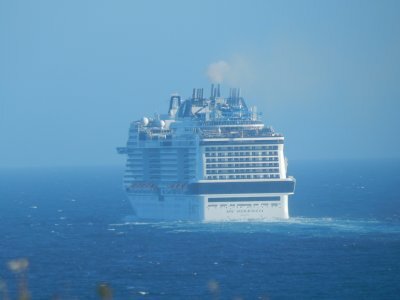 MSC Meraviglia, steaming past the Knab Cemetery, Lerwick, 31st July 2018. 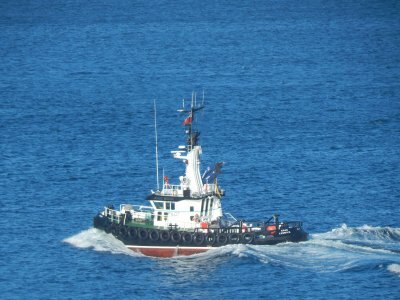 The Pilot boat, which guides cruise ships out of Lerwick Harbour into deep water. 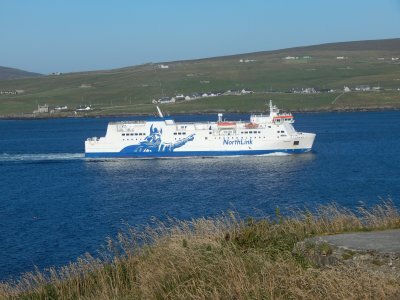 The sister ships Hrossey and Hjaltland provide a daily ferry service between Shetland and the Scottish Mainland. The Apostleship of the Sea (Stella Maris) has a particular pastoral concern for members of the crew in any sort of difficulty. Mass was said onboard the offshore supply vessel Skandi Carla on Sunday 1st July 2018 for the Filipino crew-members.